In order to draw a fair conclusion about his potential response, it is worth more closely examining the design process of the Common Core. Explicit documentation of the process that lead to the Common Core State Standards is quite difficult to find. Information from National Governors Association (NGA) press releases indicates that the writing process occurred in two phases. In the first phase, math and language arts “development work groups” worked with respective “feedback groups” to research and write the standards. In the second phase, a “validation committee” reviewed and eventually certified a final product. Members of all groups were nominated by governors and chief state school officers (NGA, 2009a; NGA, 2009b). Who was in those respective groups? All practicing teachers and school leaders of course…errrrr…. Note: Faculty in this slide represent university-level. A press release explaining the roles of the groups makes very clear that the feedback group played “an advisory role, not a decision-making role in the process” (NGA, 2009a). Decision-making powers rested with the development work groups. These groups were made up almost entirely of employees of the non-profit organizations Student Achievement Partners and Achieve, and leaders at The College Board and ACT. Among the twenty-nine total members of the teams are three higher education faculty members and one principal (NGA, 2009a). The lower-level groups represent some experts in academic fields and some knowledge of the classroom, but these people were not leaders in the process. A look into the organizations represented by the development work group – those in control of the process – will give a better sense of the priorities driving the standards. Pearson, The College Board and ACT are probably known to the reader as companies that design standardized tests and test-preparation materials. Student Achievement Partners and Achieve are likely less familiar even though both played central roles in the development of the Common Core State Standards. In fact, their involvement continues in the ongoing implementation process. Student Achievement Partners was founded by David Coleman, Jason Zimba, and Susan Pimentel – often named in the media as architects or lead writers of the Common Core. Student Achievement Partners is dedicated solely to implementation of the standards. They have created instructional materials that are offered to educators free of charge through their website and are participating in the design of teacher evaluation tools. Some of their staff members conduct professional development sessions in schools around the country. We do acknowledge that some of these staff members may have had past classroom teaching experience and participated in the creation of the standards through their roles at Student Achievement Partners (Student Achievement Partners, n.d.). Achieve, Inc. (n.d.a). About us. Retrieved from http://www.achieve.org/about-us. Achieve, Inc. (n.d.b). Our contributors. Retrieved from http://www.achieve.org/contributors. C Burris, & V Strauss. (2013, October 31). A ridiculous common core test for first graders [Web log comment]. Retrieved from http://www.washingtonpost.com/blogs/answer-sheet/wp/2013/10/31/a-ridiculous-common-core-test-for-first-graders/. Cremin, L. A. (1961). The transformation of the school: Progressivism in American education, 1876-1957 (Vol. 519). New York: Knopf. Dewey, John. (1983). The classroom teacher. In J.A. Boydston and A. Sharpe (Eds. ), John Dewey: The middle works, 1899-1924 (Vol. 15, pp. 180-189). Carbondale and Edwardsville: Southern Illinois University Press. Dewey, John. (1990). The school and society and the child and the curriculum. Chicago and London: The University of Chicago Press. Dewey, John. (2010a). My pedagogic creed. In Douglas J. Simpson and Sam F. Stack (Eds.) Teachers, leaders, and schools: Essays by John Dewey (pp. 24-32). Carbondale and Edwardsville: Southern Illinois University Press. Dewey, John. (2010b). The teacher and the public. In Douglas J. Simpson and Sam F. Stack (Eds.) Teachers, leaders, and schools: Essays by John Dewey (pp. 241-244). Carbondale and Edwardsville: Southern Illinois University Press. Kliebard, Herbert M. (2004). The struggle for the American curriculum: 1893-1958 (3rd ed.). New York and London: Routledge Falmer. NGA National Governors Association. (2009a). Common core state standards development work group and feedback group announced [Press release]. Retrieved from http://www.nga.org/cms/home/news-room/news-releases/page_2009/col2-content/main-content-list/title_common-core-state-standards-development-work-group-and-feedback-group-announced.html. National Governors Association Center for Best Practices and the Council of Chief State School Officers. (2010a). Common core state standards. Washington, D.C.: National Governors Association Center for Best Practices and the Council of Chief State School Officers. Retrieved from http://www.corestandards.org. NGA National Governors Association. (2012a). Governors work to implement the common core state standards. Retrieved from http://www.nga.org/cms/home/news-room/news-releases/page_2012/col2-content/governors-work-to-implement-the.html. NGA National Governors Association. (2012b). Trends in state implementation of the common core state standards: Educator effectiveness [PDF document]. Retrieved from http://www.nga.org/cms/home/nga-center-for-best-practices/center-publications/page-edu-publications/col2-content/main-content-list/trends-in-state-implementation-o.html. NGA National Governors Association. (n.d.). Common core state standards initiative standards-setting criteria [PDF document]. Retrieved from http://www.corestandards.org/assets/Criteria.pdf. NCEE National Commission on Excellence in Education (1983). A nation at risk. Retrieved from http://www2.ed.gov/pubs/NatAtRisk/index.html. Ravitch, Diane. (1995). National standards in American education: A citizen’s guide. Washington, D.C.: The Brookings Institution. Ravitch, Diane. (2010). The death and life of the great American school system: How testing and choice are undermining education. New York: Basic Books. Simpson, Douglas J., & Stack, Sam F. (Eds.). (2010). Teachers, leaders, and schools: Essays by John Dewey. Carbondale, IL: Southern Illinois University Press. United States Department of Education (2001). No child left behind executive summary. United States Department of Education (2009). Race to the top executive summary. United States Congress, 103rd Congress. (1994). H.R. 6 Improving America’s schools act, section 1111: state plans. Retrieved from http://www2.ed.gov/legislation/ESEA/sec1111.html. McNeil, L., & Valenzuela, A. (2001). The harmful impact of the TAAS system of testing in Texas: Beneath the accountability rhetoric. In M. Kornhaber & G. Orfield (Eds. ), Raising standards or raising barriers? Inequality and high stakes testing in public education (pp. 127-150). New York: Century Foundation. Vasquez Heilig, J. & Nichols, S. (2013). A quandary for school leaders: Equity, high-stakes testing and accountability. In L. C. Tillman & J. J. Scheurich (Eds. ), Handbook of research on educational leadership for diversity and equity, New York: Routledge. Vasquez Heilig, J., & Darling-Hammond, L. (2008). Accountability Texas-style: The progress and learning of urban minority students in a high-stakes testing context. Educational evaluation and policy analysis, 30(2), 75–110. Vinovskis, Maris A. (2009). From a nation at risk to no child left behind: National education goals and the creation of federal education policy. New York and London: Teachers College Press. I’m sorry, but I think you’ve missed the mark on Common Core here. Two points, one is that the CCSS do a fairly good job of focusing on critical thinking skills and higher order thinking skills, particularly when compared to previous state standards. The other is that higher expectations have been shown to be particularly important and valuable for minority students who suffer the most from low expectations, and benefit the most from higher expectations. I can only speak to the development of the Math CCSS, but the MATH CCSS follow closely the NCTM Principles and Standards for School Mathematics. They did not need to be rewritten because they had already had large amounts of input and research backing. The NCTM math standards had been introduced in 1989 and in a state of improvement since then. Compare the CCSS Standards for Mathematical Practice (http://www.corestandards.org/Math/Practice/) to the NCTM Process Standards (http://www.nctm.org/uploadedFiles/Standards_and_Positions/PSSM_ExecutiveSummary.pdf) then compare those to the complete lack of higher order thinking skills required in just about every previous set of state standards. Further reading through the actual CCSS shows that the standards do ask for more focus on higher order thinking. 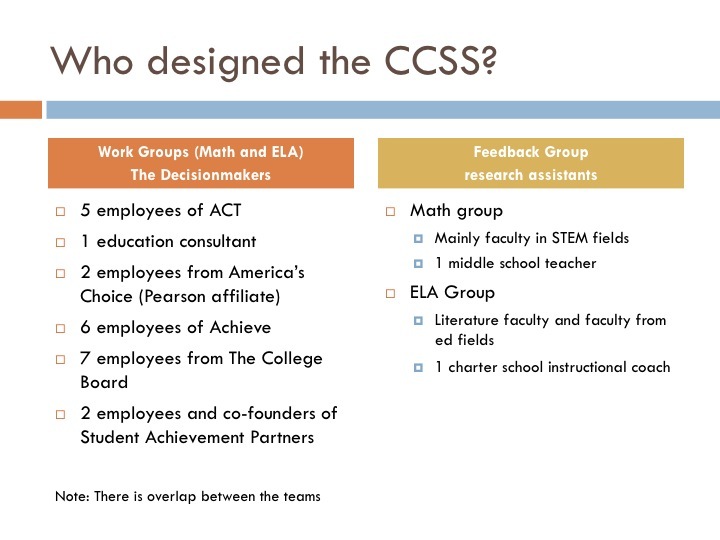 In summary the CCSS standards themselves are an improvement over the existing standards. Implementation of the CCSS may be and in many cases is far from ideal, but that is separate from the issue of the quality of the CCSS themselves. The problem is a lesson or text that claims to follow the CCSS or a particular CCSS standard is referred to or refers to itself as a CCSS lesson or curriculum. Then the failings of the lesson or curriculum are judged as failures of the CCSS when they have nothing to do with the CCSS. This is well written and I am happy, for once, someone was taking the high road in acknowledging that Common Core had several leaders involved that had/have teaching experience. What I do not understand is that this process is not different in our schools and businesses. Before Common Core we would all mumble under our breaths about principles, BOE and Superintendents were making decisions and forcing teaching requirements down our throats while state legislators were doing the same with testing. Nothing has changed, we just put a new face on the enemy. We want a say then complain about the say, we want to be charged with being the experts and professionals but we don’t want to be held to that standard… No offence, but our biggest enemy may actually be ourselves. Maybe we just thrive on negativity or maybe we are more focused on ourselves. Maybe it is not the process of being able to guide a child’s development but the need to be the person in charge of what is imparted rather than the act itself; a selfish motivation. Maybe it is this that separates those who love to teach and those who love to help children grow socially, emotionally and academically. Just found your blog and am loving all of these posts. I am currently a grad student at NYU’s English Ed (7-12) program and have gotten into a lot of discussions of the Common Core and Dewey (separately). I really appreciated the way you tied the two together. I’d like to see what a Common Core would look like if it was developed by a group of teachers and if the group had a more diverse representation in race. What difference would we see in the Standards themselves? What might be prioritized that is not currently? One of my heroine’s from Louisiana -and likewise greatly effected by Hurricane Katrina that brought her home is Mercedes K. Schneider. Her recently published book, “A Chronicle of Echoes: Who’s Who in the Implosion of American Public Education” should be part of this discussion. Thanks. First – thank you for your consistent work re: the CCSS and education reform in general! Since I wrote the forward I can say that you are quoted in the book, and I think what this book explains as the title makes clear, will help you and so many others in preserving our public school system. Also see Deb’s little blog that gives further insights into the book. Again, for all the supporters of America’s public schools – thank you for your work! Excellent post. I am teaching John Dewey’s Education and Democracy this semester and agree that education reformers are betraying Dewey’s vision. They use democratic words for corporate ends. I wonder why, though, the article has an adjacent picture of Linda Darling-Hammond with a description of her as a heroine. This month, the Alliance for Excellent Education released a report calling for a Common Core statewide accountability system. One of the authors: Linda Darling-Hammond. Point taken — and the Deweyan criticism of CCSS may go far deeper still.